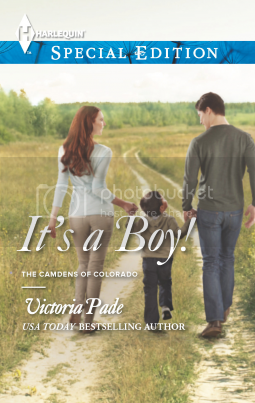 In her latest Camdens of Colorado story, USA TODAY bestselling author Victoria Pade introduces readers to a suddenly single fatherand the woman who might be his perfect match, if they can get past their feuding familes! of a rambunctious two-year-old. He's now the sole guardian of said toddler and he's never pulled diaper duty in his life! What's a man to do? I used to read a lot (and I really mean a lot) of Harlequin books but for the past few years I haven't been reading as many for some reason. Not because they aren't any good. Most are but I guess I have just been too busy reading books from my to be read pile or have been reading books to review that I just haven't had time to read many of these books. Anyways, It's A Boy! by Victoria Pade is very well written and I couldn't put it down. This is one of the best Harlequin books I have read in a very long time. This books is a short and easy read that will get you craving cheesecake. Well I love cheesecake and while reading this book I was craving some. This book isn't out yet but expected publication is July 23rd 2013 so after that day you should look for this book in your local bookstores or online.